Jumeirah Central is a multi-functional world-class transit oriented development in Dubai. The district will comprise 4.2 million sqm of cutting-edge office, retail, hospitality and residential spaces networked with over 8km of climate-controlled pedestrian streets, entertainment and leisure attractions. Since the first sketched ideas, Jumeirah Central is conceived by all related stakeholders as a unique opportunity to envisage a new virtuous approach to urban developments in Dubai and far beyond the national borders. This opportunity is pursued by setting out a firm framework of sustainability, viability and vitality of the urban built environment. Systematica works for 18 months in tight collaboration with architects (5+Design) and developers (Dubai Holding) on both Concept Master Plan (CMP) and Detailed Master Plan (DMP) contributing significantly to the definition of a reliable and diversified transportation network. During the conceptual phase, an efficient, multi-layered and integrated mobility strategy is devised with the aim of defining the underpinning transportation planning and engineering principles; during the detailed phase, the strategy is further developed into an effective transport master plan, designed to create a high-quality urban environment and influence transport planning not merely within Jumeirah Central but at wider city scale. 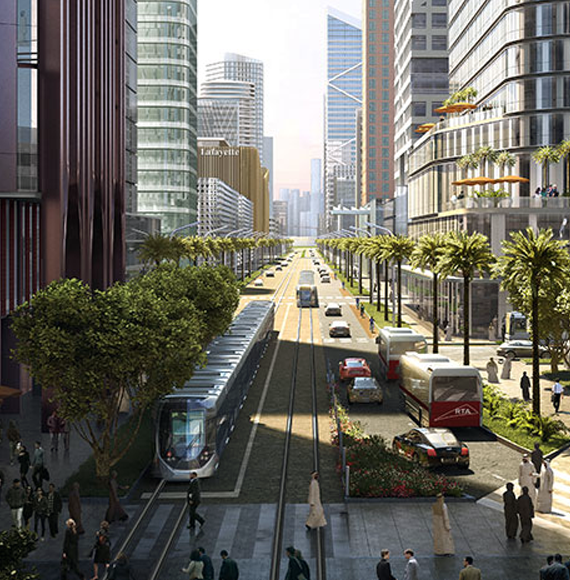 Indeed, the main goal to what all transport strategies converge is the creation of a new model of public urban realm in Dubai, possible through a seamless permeability with the surroundings and an intuitive internal navigation. Transportation in Jumeirah Central and its consequent traffic impacts is a decisive element in ensuring an accessible project with mitigated impacts on existing network. On this concern, Systematica organises and develops the comprehensive master plan by addressing the following main aspects: travel demand and catchment areas analyses; public transport; soft mobility; private traffic, and; parking strategy. The first component Jumeirah Central transport master plan, on which the master plan itself is hinged on, consists of the travel demand and catchment areas analyses. This two-fold study is developed to: 1) reveal the existing Dubai’s PTAL (Public Transport Accessibility Level) and mobility patterns. 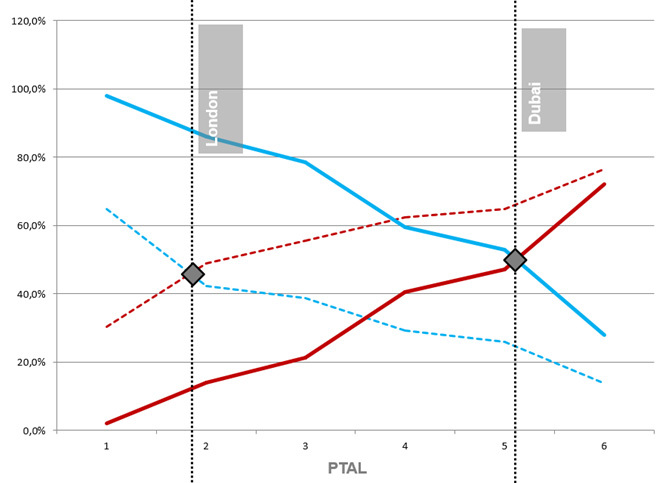 Dubai’s PTAL is assessed, forecasted and compared to the one in London, used as an exemplary reference. Systematica proposes a strategy foreseeing an average of PTAL 5 across the entire Development, therefore capable to shift around 50% of trips to Public Transport. PTAL plays a key-role in defining transport strategies, since users’ modal choice depends strictly on it. In turn, users’ attractiveness depends on land use provision, reason why Systematica studies the impact of different land use mixes on internal capture rates, to analyse said relationship and identify the most appropriate land use mix that would eventually achieve the highest internal capture rate. Catchment area analyses are finally carried out to define Jumeirah Central’s future catchment area by car and by Public Transport. The results are very encouraging since they show that, despite the car oriented transport infrastructure of Dubai, during peak hours and further to the completion of the provisioned PT infrastructure both modes will achieve a very similar catchment area, in line with the modal share assumptions discussed above. Jumeirah Central’s potential towards Public Transport is gained and granted through a multi-modal and sound PT strategy envisaging a network composed of 30 lines (bus, tram and SZR), 47 new stops, 25 interchanges and 1 transport hub. The so-defined network permits that each outdoor area of Jumeirah Central is at 2-minute walking from any public transport stop. PT strategy is enriched by a detailed plan for soft mobility, comprising both cycles and pedestrians, and developed in fully compliance with LEED ND for Neighbourhood Pattern and Design. If on the one hand, cycle lanes and bike sharing are proposed, with the aim of connecting all PT stops each other, on the other hand, pedestrian network is developed to include the variety of pedestrian streets typologies: shaded streets, climate-controlled streets, arcades, malls corridors, etc. Particular attention is paid to climate conditions, in defining pedestrian network and different paths are planned for warm and cooler seasons. Private transport represents another component of the multimodal transport master plan conceived by Systematica for Jumeirah Central. The various aspects of Private Transport are tackled in an integrated way, starting for traffic distribution until network performance assessment. 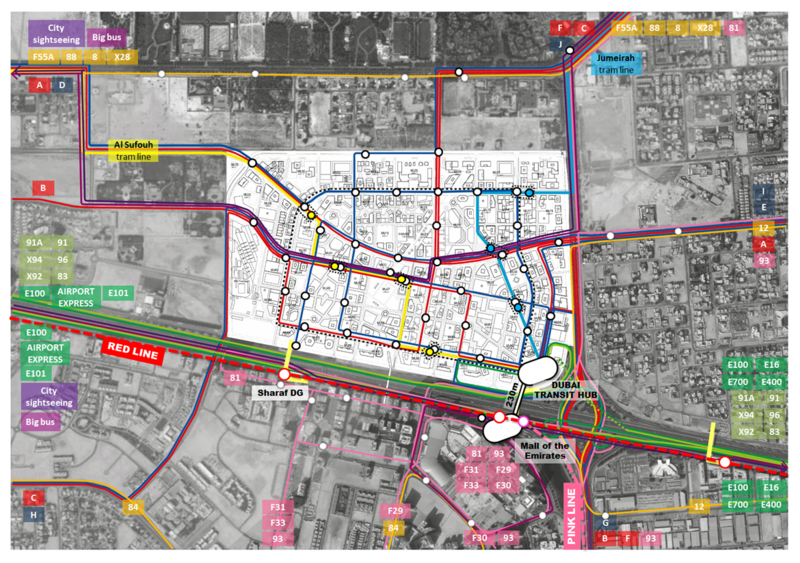 Traffic distribution is observed and studied to define the main inbound and outbound routes to/ from Jumeirah Central. Existing road network at fringes is surveyed along with road intersection and traffic light provisions, for which a re-organisation plan is presented. Accessibility is then evaluated, taking into consideration the phase-based development of the entire Project. Finally, a comprehensive study of the proposed network for Private Transport is carried out, including both proposed road and junctions. Geometrical and functional layouts of proposed new roads are also designed and included in the master plan. Last but not least, a special focus is dedicated to parking demand and provision, deemed a strategic private-transport-related aspect. Parking demand is assessed and parking provision is planned for the entire Jumeirah Central’ site. 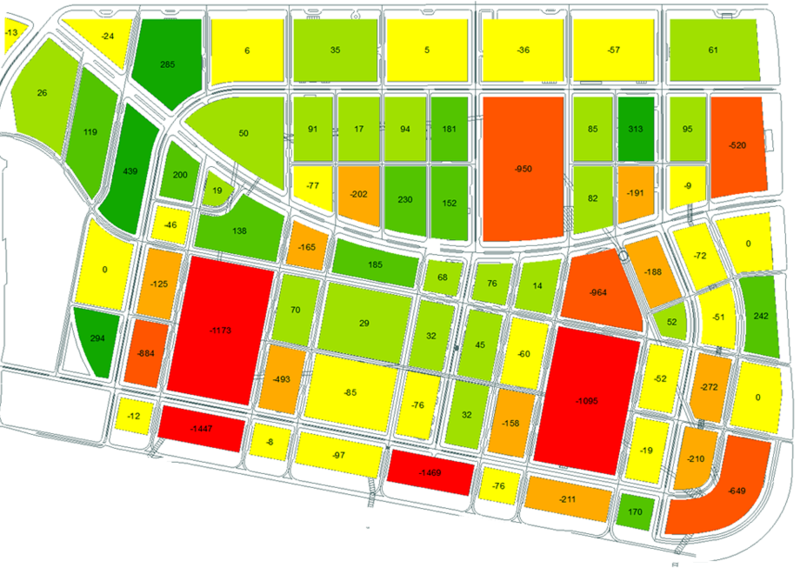 Parking provision is distributed according to the forecasted demand per each single block, estimated based on the land use and population of the considered block. 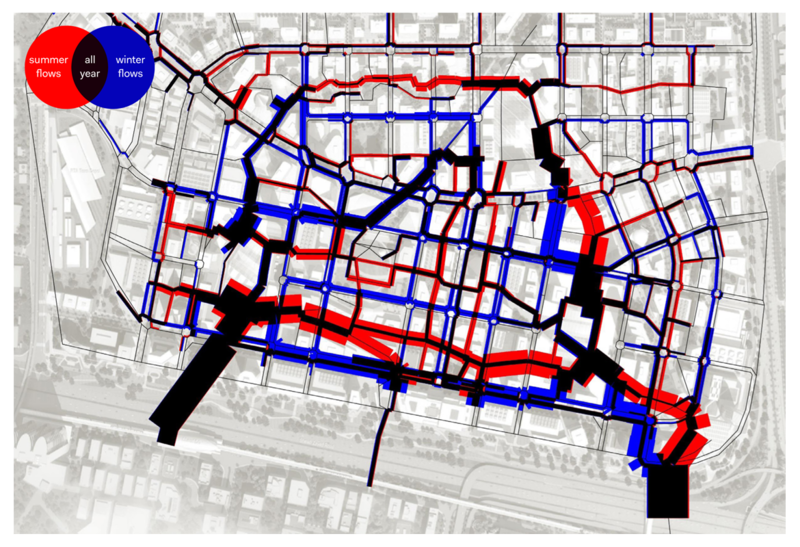 The results of this study are then mapped to indicate the parking demand/provision by plot ratio and quantify the parking demand to be relocated. Jumeirah Central will bring together for the first time, all of the city’s transport networks into one thoughtfully integrated smart system that will not only interconnect the areas of the district, but also unite Jumeirah Central with the surrounding neighbourhoods of Dubai. Designed to enrich human lives, Jumeirah Central is a visionary district that aims to connect people to their city and the city to its people. Sustainability, viability and vitality of the urban built environment: 3 key concepts on which Jumeirah Central’s virtuous approach to urban developments is hinged on. Jumeirah Central will bring Dubai’s multi-modal transport network into the first thoughtfully integrated mobility smart system.